The greater part of Americans wishes they had added vigor and energy throughout the workday. However, the greater part of Americans also know that stress reduction, proper rest, and regular exercise are critical to helping you get that much-needed lift. To achieve these goals, your health and wellbeing must be of the highest importance. The Metabolic Code – a method for determining the state of your vitality and wellness – can help you to regain your concentration on health and guide throughout your health revitalization journey. The Metabolic Code genuinely believes that all people are deserving of vitality during all chapters of life. Your wellbeing is the end result of the involved relationship among lifestyle decisions and how the decisions you make on a daily basis can help frame your metabolic health. The Metabolic Code indexes your health through a variation of levels to form a valid vantage point of where your contemporary health is while observing and confronting the vital philosophies of metabolic, aging, and lifestyle factors that could be interfering with your metabolism from performing correctly. The Metabolic Code Health Assessment and Vitality Report is a constructive, and systematic report that joins inferences from a private survey, lab tests, and biometrics to stimulate the progression of health while simultaneously decreasing issues that can adversely impact your wellbeing. Your personal data is chronicled and catalogued into Triads to generate an elite report that presents a wide-ranging representation of your modern metabolic chemistry. 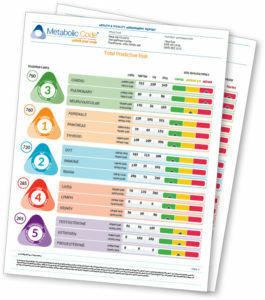 The Metabolic Code Health Assessment and Vitality Report denotes where you can initiate progress on the Triad relationships with lifestyle, dietary, and targeted supplements directed to your unique needs. Based on more than 30 years of clinical application and research, the center of the Metabolic Code lies within the metabolic Triads. Metabolic Triads unite critical organ systems into groupings of three body systems that operate carefully together and represent the convoluted interdependence of the systems which can activate adjustments in your metabolic wellbeing. Your metabolism is considerably more than how many calories you consume, or the amount of calories used; metabolism is the accrual of all biochemical reactions in your body during the course of your lifecycle. If you are looking to restore vitality, boost energy, or boost your overall wellbeing, Dr. Garcia at Polaris Rejuvenation can help create a customized treatment plan intended to enhance health and vigor with the Metabolic Code.